Recently, I swung by the local garden center and picked up a few Chrysanthemums and some mini white pumpkins. 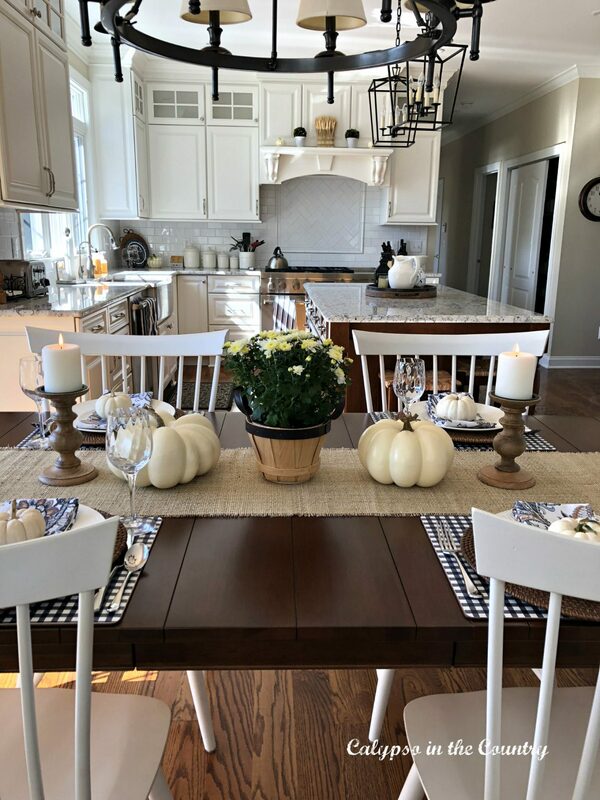 With so many natural accessories available this time of year, it’s easy to set a table for the fall! I just happened to find this little wooden basket lying around from last year. 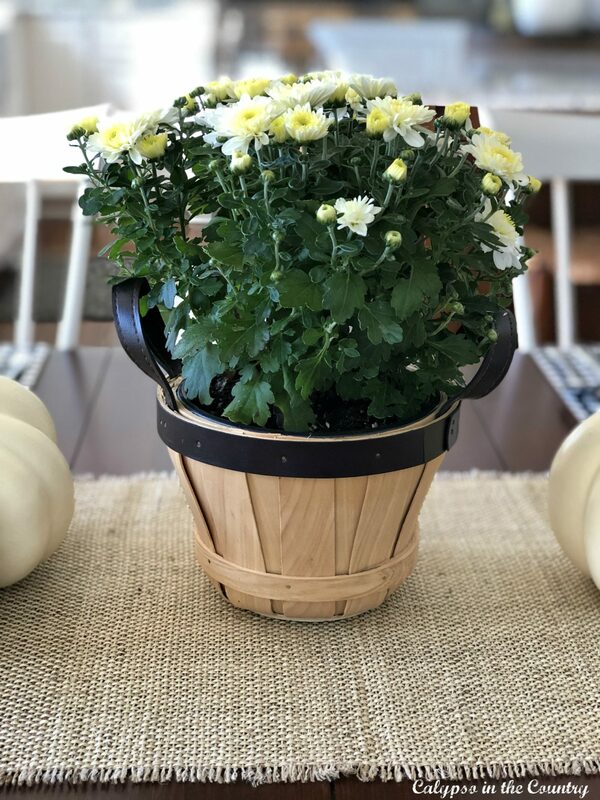 The basket was the perfect size so I plopped in a simple mum for a no-fuss centerpiece. 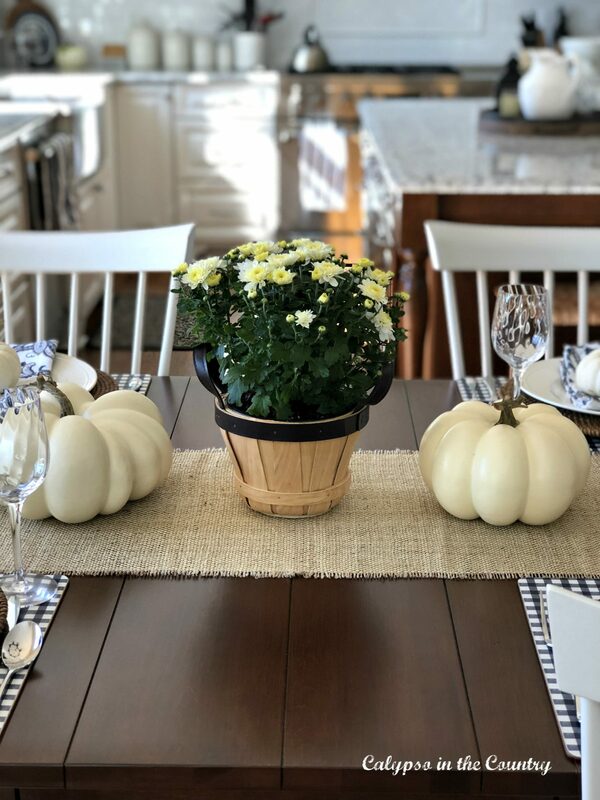 Since my kitchen is white with some wood tones, it made sense to decorate the table the same way. For a quiet splash of color, I used these napkins from Homegoods. 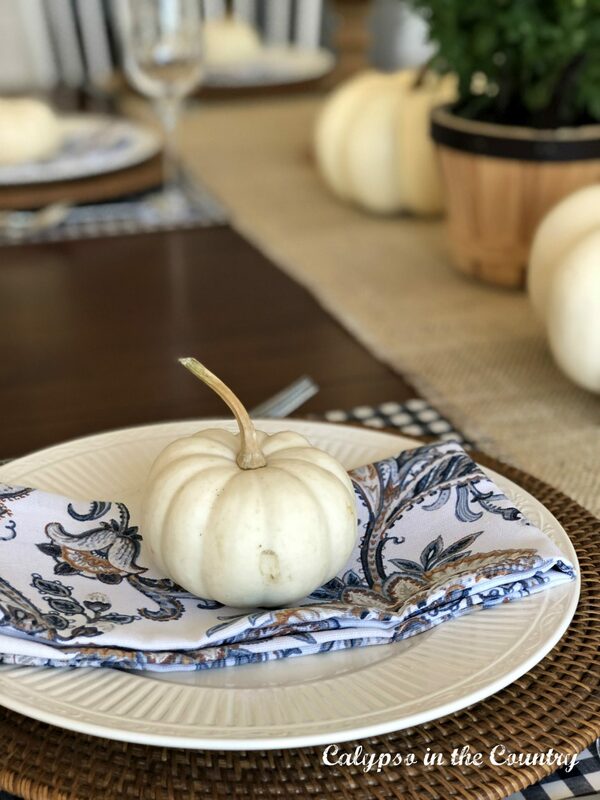 Placing a mini white pumpkin on top of each napkin is an easy way to add some fall decor to each place setting. 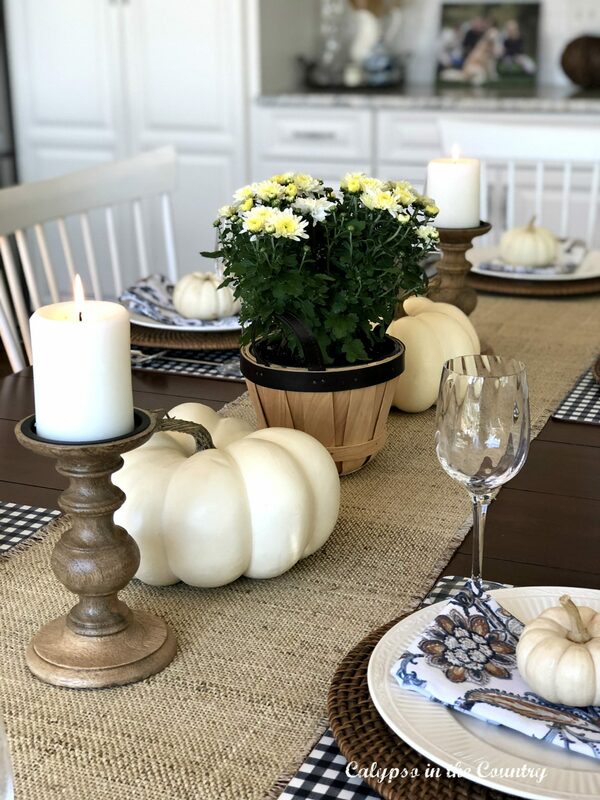 Since I haven’t found any larger (real) white pumpkins yet, I just used a couple faux pumpkins from Michael’s Craft Store for the center of the table. The artificial pumpkins are looking better and better these days and it’s nice to mix them in with real ones. A burlap table runner is so versatile with the way it blends in with most styles. On a recent shopping trip to World Market, I picked up the wooden candlesticks. I have a feeling I will get a lot of use out of them! After all, every table setting needs some candles! 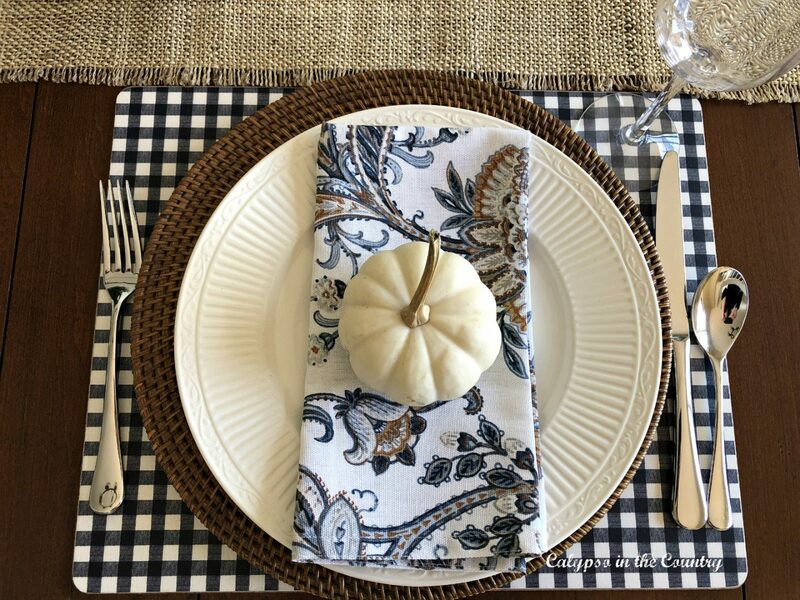 The blue and white checked placemats from Pottery Barn make the perfect backdrop for each setting and coordinates so well with the napkins. Of course, you can’t go wrong with basic white dishes to complete the look. Rattan chargers go with almost everything as well. 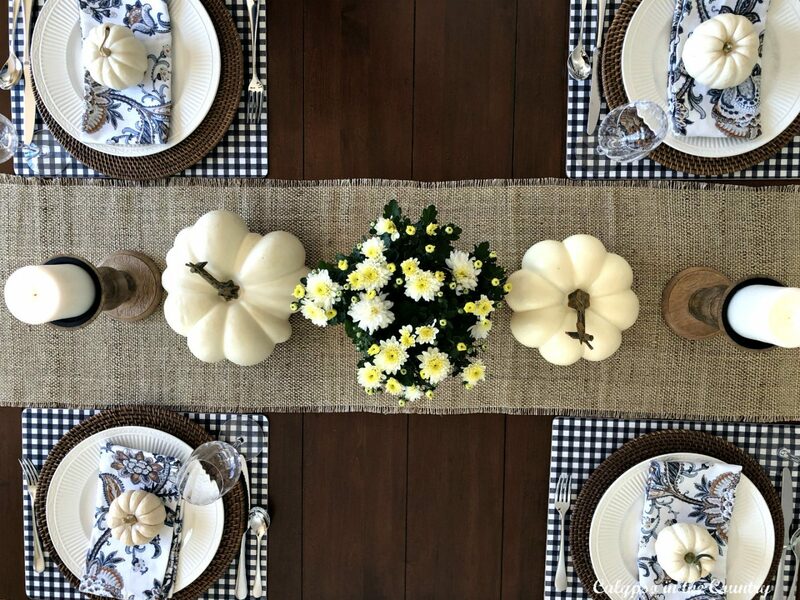 My tablesetting ended up having a casual farmhouse vibe…which I think is perfect for fall. Burning a couple candles makes the room feel so cozy for fall. I always use unscented candles for table settings so they don’t overpower the food. 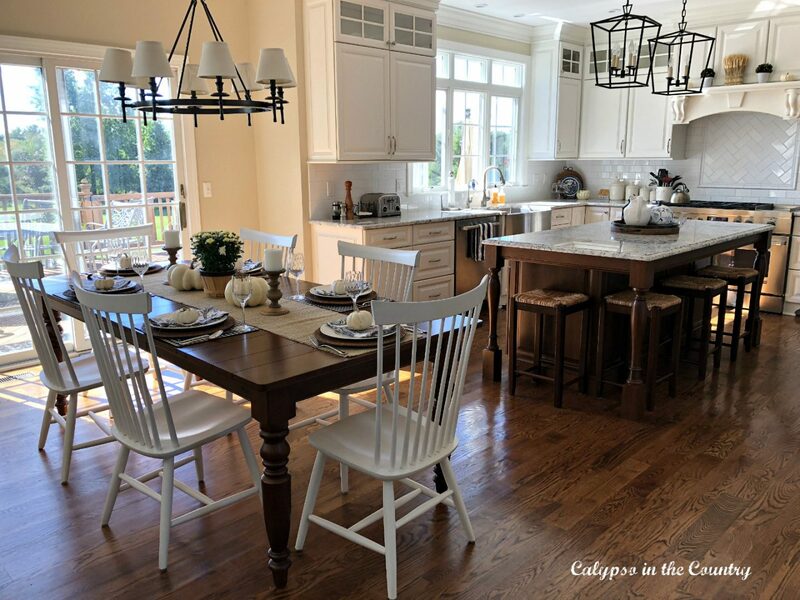 After several rainy days, the sun finally appeared today and filled my kitchen with light. Now, I just hope the mums survive inside! From what I have learned, mums can be kept indoors as long as they are exposed to enough light and are watered regularly. Sounds easy enough…but then again I’ve killed every other plant. Why do I think I will be successful with these? Oh well, it can’t hurt to try! 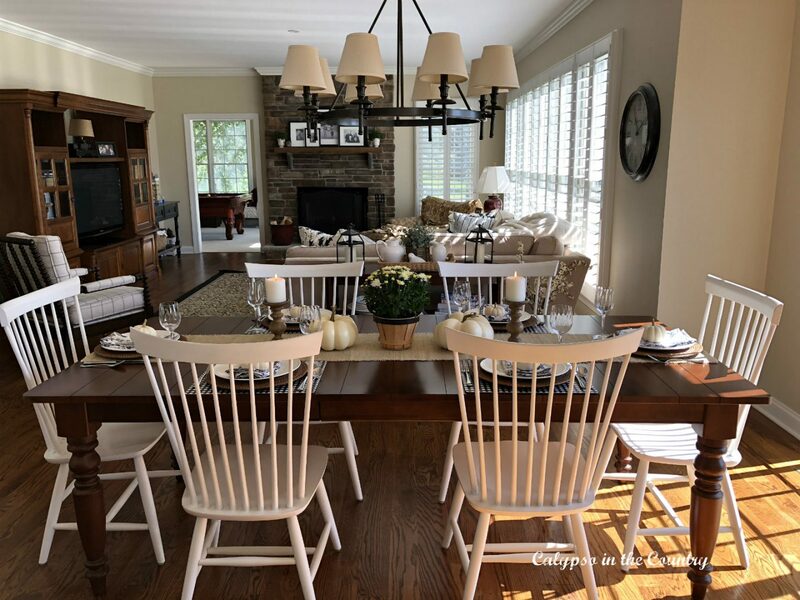 Thanks for stopping by to see my latest table setting! 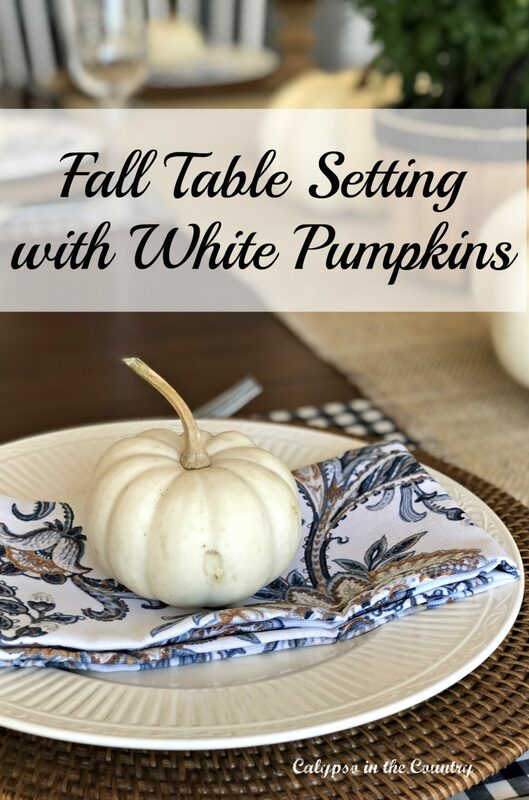 If you love white pumpkins as much as I do, be sure to visit my other white pumpkin posts for more inspiration! 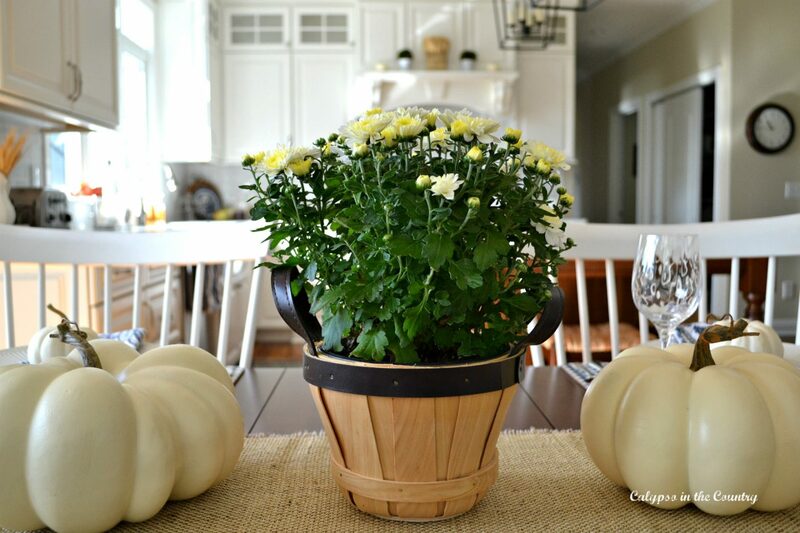 What do you like to use on your fall table? So pretty Shelley. I haven’t bought the first pumpkin this year. I refuse until fall weather gets here. I am so over this muggy heat! Hope you have a great weekend! Thanks, Kim! It took me awhile to get in the fall mood. Luckily we had a couple cooler days which helped. If only this rain would stop now! Enjoy your weekend too! This is so simple and pretty Shelley! I am on the less is more bandwagon! Thanks, Cindy! I agree with you about less is more! I just can’t get enthusiastic about dragging all those bins up from the basement only to clutter up my house! What a beautiful table setting! I love those napkins! The PERFECT addition to the table! Thanks Karianne! 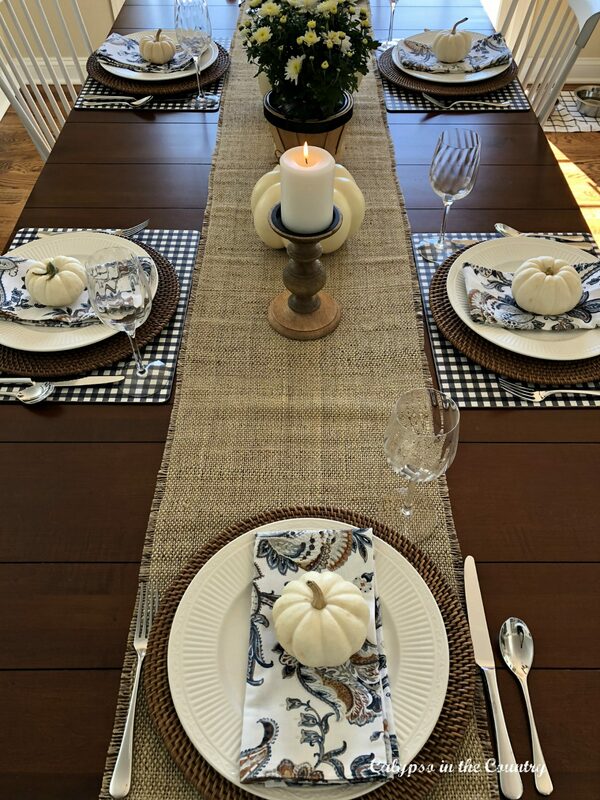 I love it when a set of inexpensive napkins helps pull a whole table together. Thanks for stopping by and happy fall! I absolutely love your table! The neutrals are so subtle, and I also love the chargers. I think we have the same plates! Thanks Tanya! Gotta love those Mikasa Italian Countryside dishes! Enjoy your weekend! 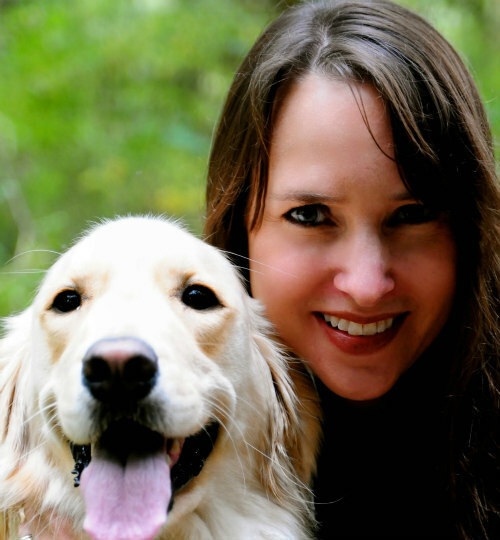 Shelley, you do such a nice job…inspiring, for sure! 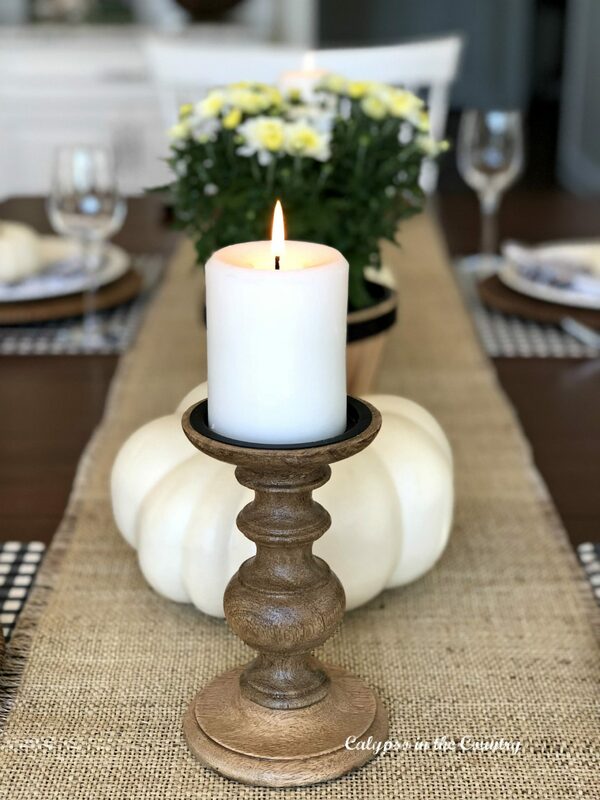 I have some similar candle holders and sometimes use them for small pumpkins instead of candles. Thanks so much, Becky and great idea for the candle holders. I’ll have to try that… Thanks for stopping by! This is a very pretty table setting! The white pumpkins are perfect! Thanks Candice! White pumpkins are always my favorite for fall! 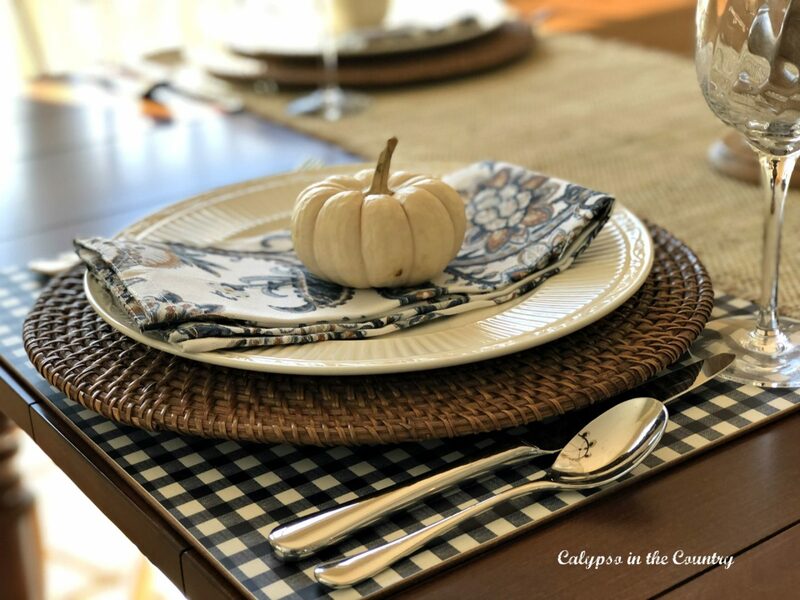 I love the simplicity of your tablescape. I use a burlap runner on ours because it goes with everything. But I think I need to look for new napkins and placemats this year before everything gets picked over. I love yours! Thanks so much, Carol! Burlap runners really are versatile aren’t they? Enjoy your week!